I’m just back from a cross-country, truck camping trek: 6,200 miles, 11 states, and dozens of hours of listening to books and music. The work of David Foster Wallace, the amazing writer of fiction and non-fiction who died in 2008 at age 46, is a favorite choice for rides like these. 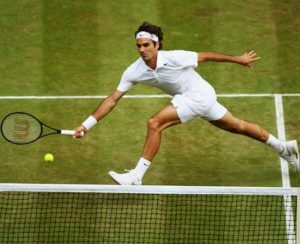 In 2006, Foster Wallace wrote the essay, “Roger Federer as Religious Experience” for the New York Times. 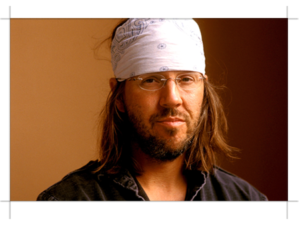 Foster Wallace was a nationally ranked junior tennis player and he brings to the pages an healthy understanding of the game. 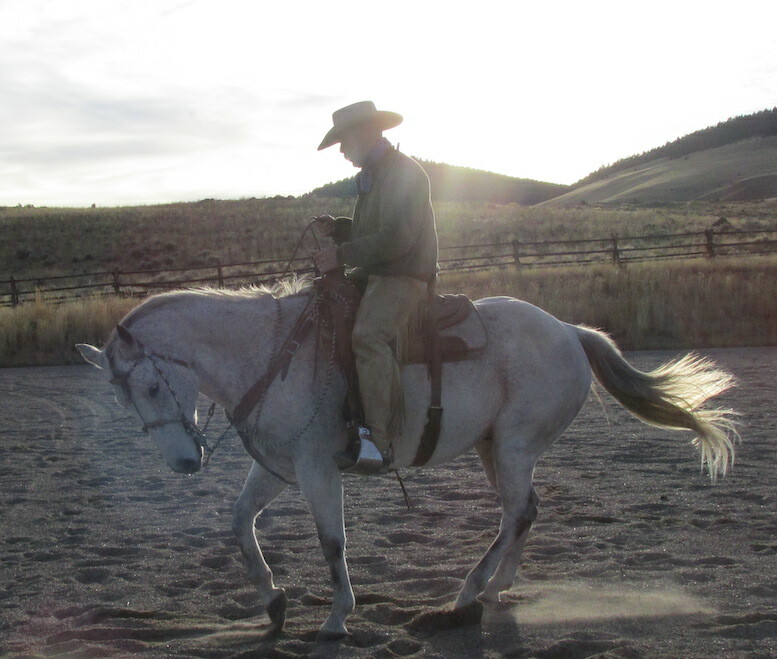 He didn’t know horses and rode only a handful of times. But I’m betting you will see parallels in the athleticism of feel. Imagine that you’re a person with preternaturally good reflexes and coordination and speed, and that you’re playing high-level tennis. Your experience, in play, will not be that you possess phenomenal reflexes and speed; rather, it will seem to you that the tennis ball is quite large and slow-moving, and that you always have plenty of time to hit it. That is, you won’t experience anything like the (empirically real) quickness and skill that the live audience, watching tennis balls move so fast they hiss and blur, will attribute to you. By way of illustration, let’s slow things way down. Imagine that you, a tennis player, are standing just behind your deuce corner’s baseline. A ball is served to your forehand — you pivot (or rotate) so that your side is to the ball’s incoming path and start to take your racket back for the forehand return. Keep visualizing up to where you’re about halfway into the stroke’s forward motion; the incoming ball is now just off your front hip, maybe six inches from point of impact. 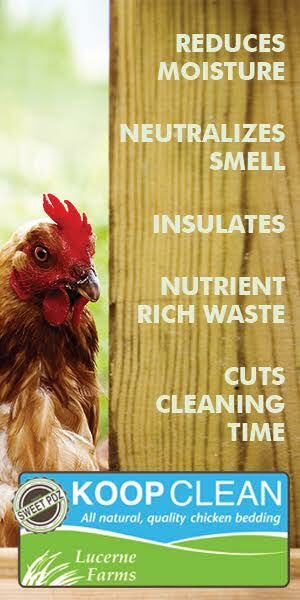 Consider some of the variables involved here. On the vertical plane, angling your racket face just a couple degrees forward or back will create topspin or slice, respectively; keeping it perpendicular will produce a flat, spinless drive. Horizontally, adjusting the racket face ever so slightly to the left or right, and hitting the ball maybe a millisecond early or late, will result in a cross-court versus down-the-line return. 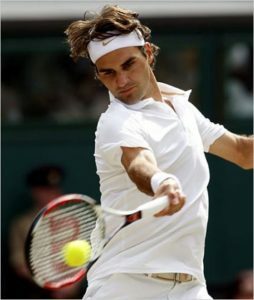 Further slight changes in the curves of your groundstroke’s motion and follow-through will help determine how high your return passes over the net, which, together with the speed at which you’re swinging (along with certain characteristics of the spin you impart), will affect how deep or shallow in the opponent’s court your return lands, how high it bounces, etc. These are just the broadest distinctions, of course — like, there’s heavy topspin vs. light topspin, or sharply cross-court vs. only slightly cross-court, etc. There are also the issues of how close you’re allowing the ball to get to your body, what grip you’re using, the extent to which your knees are bent and/or weight’s moving forward, and whether you’re able simultaneously to watch the ball and to see what your opponent’s doing after he serves. These all matter, too. Plus there’s the fact that you’re not putting a static object into motion here but rather reversing the flight and (to a varying extent) spin of a projectile coming toward you — coming, in the case of pro tennis, at speeds that make conscious thought impossible. Mario Ancic’s first serve, for instance, often comes in around 130 m.p.h. Since it’s 78 feet from Ancic’s baseline to yours, that means it takes 0.41 seconds for his serve to reach you. This is less than the time it takes to blink quickly, twice. Successfully returning a hard-served tennis ball requires what’s sometimes called “the kinesthetic sense,” meaning the ability to control the body and its artificial extensions through complex and very quick systems of tasks. English has a whole cloud of terms for various parts of this ability: feel, touch, form, proprioception, coordination, hand-eye coordination, kinesthesia, grace, control, reflexes, and so on. …Hitting thousands of strokes, day after day, develops the ability to do by “feel” what cannot be done by regular conscious thought. Repetitive practice like this often looks tedious or even cruel to an outsider, but the outsider can’t feel what’s going on inside the player — tiny adjustments, over and over, and a sense of each change’s effects that gets more and more acute even as it recedes from normal consciousness. Sounds a bit like horsemanship to me. It’s hard. It takes a lot of practice. A lot of what we do is honed from scores of previous micro-moments and our ability to immediately assess each scenario. Read a different take on it here.